Heatherlie Quarry is a significant historic landmark ad visitors to the Grampians often come here to check out this historic location and its surroundings and nearby scenic points. Stone mined from the quarry has been used in many important buildings in Melbourne including; Parliament House, the Town Hall and the State Library. 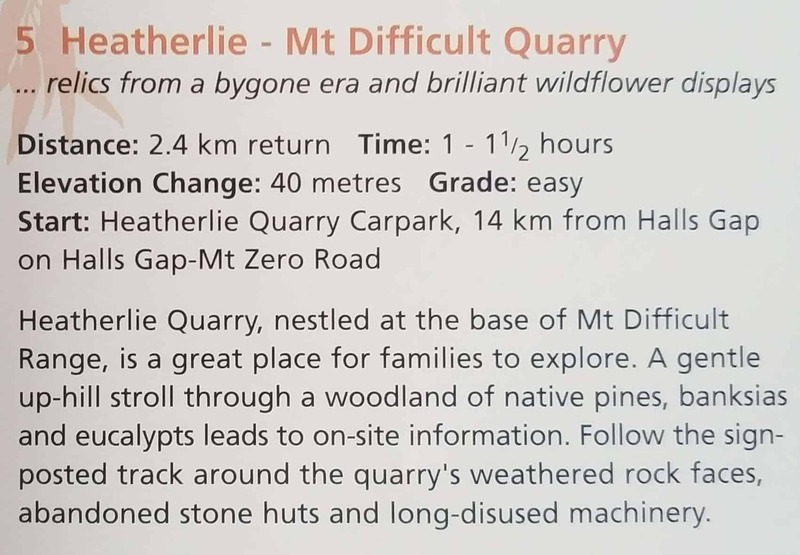 A wide variety of scenic walking tracks are found near by and visitors can take narrated tours to understand and learn more about the history and significance of Heatherlie Quarry. As a spot next to the scenic Mount Difficult Ranges, the region houses a number of trails, bushwalking tracks and several scenic routes. Visitors with kids can also take the gentle climb to the Heatherlie Quarry’s rock face and the mountain peaks in the region. A carpark is located nearby, and it is an easy walk up to the Quarry at only about a 2km round trip. You will enjoy panoramic views of the area from the mountainous peaks and viewing platforms. In spring, the area becomes vibrant with blooming spring flowers and colourful wild flowers. Also, a trip to the nearby Wartook Gardens is an excellent sightseeing opportunity for those looking for a peaceful setting.